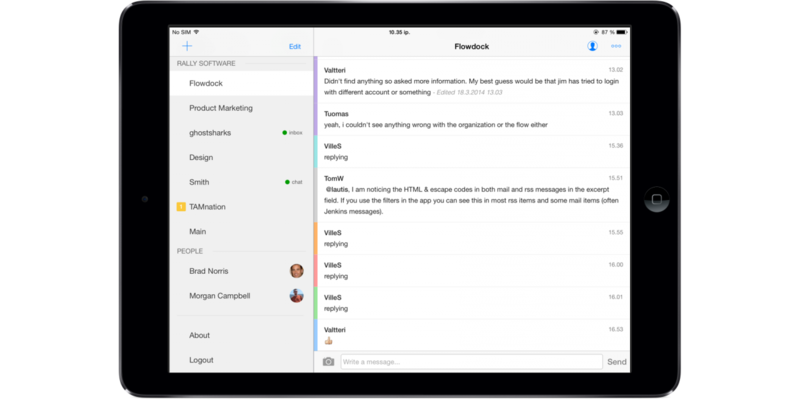 Flowdock for iPad finally out! If you use Flowdock on your iPhone, you might have spotted an update last week. The update was actually a fairly extensive evolution of the app as a whole. The biggest individual change is support for iPad, which means the app can now be used with essentially any device running iOS (7.0+). Install the app here. On iPad, the new app uses the familiar split screen view that you’re used to seeing in Apple’s Messages or Mail app: your flows are on the left and chat/team inbox for the selected flow on the right. The second big improvement is switching between chat and team inbox. When you’re in chat, a simple swipe to left will take you to team inbox and a swipe to right will take you right back to chat. It’s super simple and quick. We’ve also added support for landscape mode across all devices. It works wonders when you need to compose longer messages on the go. On top of these changes, we’ve made plenty of other small fixes and improvements. Send us lots of feedback, bug reports and feature requests to support@flowdock.com – we will keep improving these apps!